MADERA, CALIFORNIA (May 21, 2018) – The annual Memorial Day Weekend “Military Tribute Night” at Madera Speedway is this Saturday night, with the fourth rounds for the RPM Mortgage Pro Late Model Series and 51FIFTY Energy Drink Jr. Late Models on deck. The MAVTV-televised series continue their championship battles on the one-third mile oval with Mini Cups vs. Bandoleros, Modified Super Toyotas, and Toyota Sedans also in action. A disastrous DNF in 20th position out of the 27 car field on April 28th knocked Matt Erickson out of the RPM Pro Late Model points lead. The winner of the first two races of the season now finds himself in an 11 point hole behind 15 year-old Austin Herzog. Herzog, the 2017 series Rookie of the Year and six-time Jr. Late Model feature winner, had his career best second place finish capitalizing on Erickson’s misfortunes. Herzog and Erickson ran side-by-side for the lead of the April 8th round #2 and appear poised to continue that battle into round #4. Garland Tyler is third in the standings head of 2017 Pacific Challenge Series Rookie of the Year Jack Wood. Wood, age 17 from Loomis, CA, had his career best stock car finish when he finished third in the last event. The race winner last month was Blaine Rocha in a strong performance. Former track champion Rick Thompson rounds out the top-five in the standings. 80 laps are scheduled with the traditional format of a 50 lap opening segment followed by on track adjustments and MAVTV interviews, then a 30 lap sprint to the finish. 2017 51FIFTY Jr. Late Model champion Jesse Love has taken points lead in the division despite a severe crash that prevented him from finishing round #3. Love, previous points leader Tanner Reif of Las Vegas, and Anthony Guaimano were all tangled in the melee coming out of the race’s halfway break. The championship has tightened considerably with Love leading Reif by eight points. Dylan Zampa’s two wins have propelled him to third in the points in a tie with Bakersfield’s Kabe McClenny. The top-four are separated by just 13 points while Watsonville’s Lilly Mead is in fifth but only 27 points out of first herself. The drivers ages 10-16 years old compete in 70 lap features with a 40 lap opening segment and a 30 lap conclusion. The inaugural Mini Cup vs. Bandolero series has seen all six trophies won by Bakersfield drivers. Kale McClenny has scored all three Mini Cup wins. He topped Aaron Thomas for the Mini Cup victory in the combined race by just .005 seconds in the third race of the year. On the Bandolero side, female driver Kercie Jung won the first two races. Her absence in the third race opened the door for fellow Bakersfield female Riley Massey to motor on to victory. The largest combined field of the season is expected on Saturday as these young men and women battle for 20 laps with coverage on MAVTV. 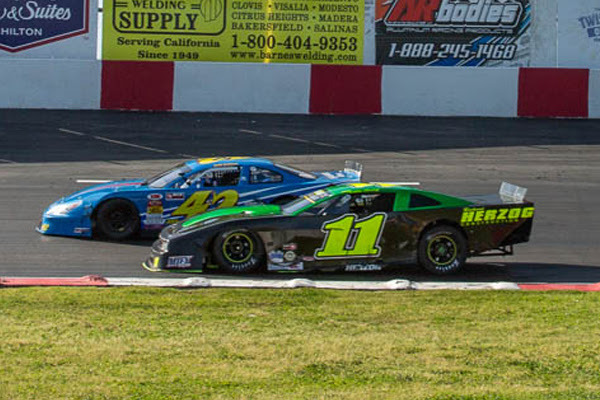 Toyota Sedans and Modified Super Toyotas form the foundation of the Madera Speedway schedule and have had a busy start to 2018. 2016 Sedans champion Jillaun Holden has four wins and a second place finish to lead rookie Greg Tyler by 44 points with Thomas Magray in third. On the Modified Toyota side of things, Patrick Geiger enjoys a four point advantage over “Dirt” Bert Stephens with May 12th winner Ryan Reynolds quickly closing in from third in the points. Madera Racing on MAVTV airs Thursdays re-runs of the 2017 season every week. The show airs at 5 p.m. and 8 p.m. PST and is also available on the Lucas Oil Racing TV app. New 2018 episodes will begin airing later this spring. Madera Speedway 2018 Schedule Celebrating 47 years of Racing! September 14th - 46th Annual Harvest Classic Night #1 presented by ($5 Ticket Night!) for everyone on night one. Madera Late Models, Madera Hobby Stocks, F4 Beater Cross , MST, Toyota Sedans, USAC Western Midgets and Modified Truck Pulls! September 15th - 46th Annual Harvest Classic presented by Midland Tractor and John Deere! The Western Winged Super Sprint Series, BCRA Midgets, USAC Western Midgets, NCMA Sprints, CSS/360 Super Modifieds, Legends of Kearney Bowl, California Hard Tops, Plus the Blown, Injected multi engine Pulling Tractors! October 20th - 11th Annual iPull-uPull Pumpkin Smash Halloween Bash and Blow Up and Monster Trucks!, Madera Hobby Stocks, MST's, Toyota Sedans, $2,000 to Win 200 lap Enduro, the Extreme Barrel Racing Series, a Trick or Treat thru the Pits and on Track PUMPKIN SMASH for the KIDS!